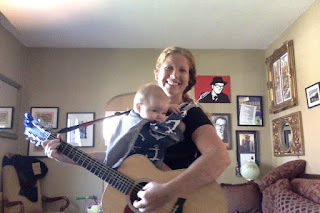 I should re-title this blog "Twice a Month Whinges about Motherhood and Art" because that's pretty much where my head is. Also, my Red Accordion was essentially stolen a few years ago, and my adventures have not involved a passport recently. I'm going insane that my new album isn't finished yet. My baby won't sleep and more importantly won't nap, ergo I can't work. I'm getting a little sensitive about people who tell me it must be nice not to work because I do work and I want to work more. I've been completely slammed with current gigs, but I've failed to do the important admin stuff of booking NEW gigs. I missed another important deadline this morning, and so as of November 4, I am unemployed. My grandfather, a professional trumpeter, warned me about being a self-employed musician. He said, "Remember, after every gig, you are unemployed." It's not been a bother before, but with children, it's just insert-The-Scream-emoji-seven-times. 2) you have to play the guitar. All of which are the things I need to do. Maybe when he gets more comfortable with the back carry, this will be easier? I managed a little musical work this morning, but my wrists hurt from playing the guitar at the wrong angle. In the mean time, I'm thinking about doing Facebook live concerts every day this week with the wee boy strapped on. Yes to the Facebook concerts! And you need to use that passport.